Ages 6 and up. Students in special education programs often struggle to learn basic sight words such as and, with, and this. By teaching sign language symbols for these words, an association is established that facilitates learning. Signs for nouns and verbs are shown in conjunction with a printed word and an illustration of the item or action. 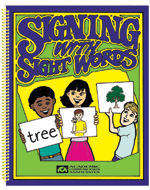 You can use the reproducible signs, printed word cards, and pictures in this book to teach basic sign language OR to facilitate the development of basic reading skills. The easy-to-use materials make it easy to teach American Sign Language symbols for common nouns, verbs, and basic sight words emphasized in the primary elementary school grades. The activities provide students with practice in signing the words and sentences that they read. Everyday Nouns. Each worksheet in this section includes a printed word, sign, and a picture showing the noun represented by the printed word and sign. Picture Verbs. Each page in this section includes a printed word, sign, and a picture showing the action represented by the word and sign. Common verbs relating to basic needs and common activities are represented. Word and Sentence Fun. Each worksheet in this section includes a printed word, sign, and a short sentence to show how the target word is used. Most of the words in this section are abstract concepts, function words, and words that cannot be represented easily in a picture. Examples of words included are put, have, on, with, and, at, and is. Matching Words with Signs. Students are asked to match printed words with sign language equivalents and to write these words under the appropriate sign. Identify the Sentence. Students are asked to look at "sign language sentences" and to write out the words represented by these signs. The activities in this book help students to read and sign the individual words that they encounter in early reading activities within the classroom. The activities can be used in a variety of ways to help special learners improve language and literacy skills.